Recently, I received a big carton box of goodies which was sent to me by my Mom through one of my friends who had visited Bangalore.The box contained various powders, masalas, snacks, sweets which are all home made and also other small grocery items which I do not find in Mumbai.Though my Mom had already mentioned to me about the goodies she was sending, I was really excited to unpack the carton box to see the various goodies she had sent.Among all the stuff, Sago Murukku and these Spicy Palakayalu caught my attention when I opened the box . My mom usually makes these Spicy Palakayalu to add them to Avarekalu mixture during their season.Though I am not a fan of the Avarekalu mixture, I used to pick the spicy rice flour balls (palakayalu) from the mixture as I just love to munch them, as they are really spicy and very tasty.That is the reason my mom sent me an extra packet of those spicy rice flour balls.Moms are the best,they know what we like and what we want.I think its time I head to the recipe,here you go!! Mix Rice flour,maida and chiroti rawa in a bowl. Add sesame seeds,red chili powder,hot oil and required amount of salt to the mix and mix well. Add water slowly and knead it into a slightly stiff dough. Pinch a small portion of it and make into very tiny balls and arrange them on a kitchen napkin or on a plate.This process is bit time consuming to make in large portions.You can even roll the mixture into a 1/2 cm thickness thick chapati and use a knife or pizza cutter and cut them into very small diamonds.This saves lot of time.While rolling them into balls do not apply much pressure,if it is rolled too tight into a ball,there are chances that they might burst in oil. Meanwhile heat oil in a kadai for deep frying.Add the prepared balls(or diamonds) and deep fry them on low-medium flame until they are crisp and golden brown in color.Do not over load the kadai with more balls at once,deep fry them in small batches. Drain them in a kitchen napkin. 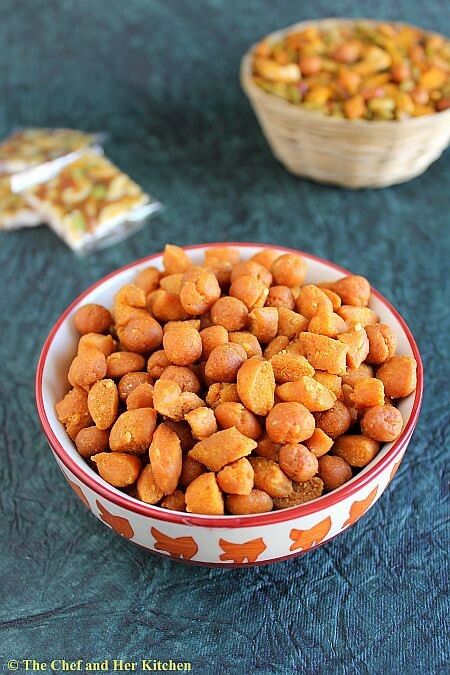 Store them in air-tight container.You can eat them as they are or you can also add them in various mixtures, Kara Pori, Sago mixture, Cornflakes mixture, Avarekalu mixture etc. 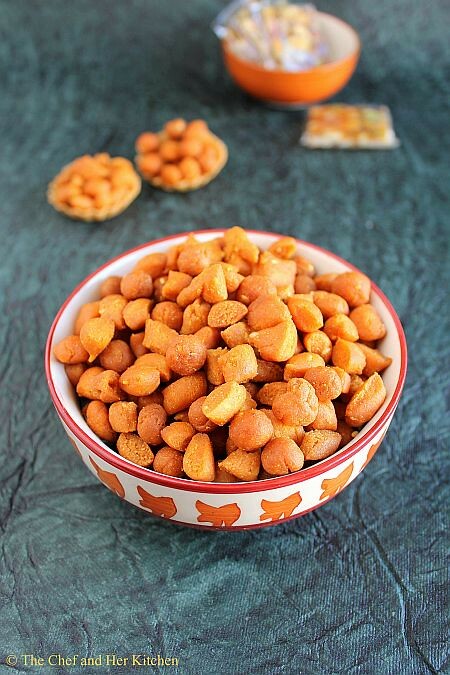 Chiroti rawa(very fine variety of rawa also called as Holige rawa) makes these balls very crisp and also have nice texture.If you do not get it you can use normal rava,just pulse it in mixer for a couple of times and use it in the recipe. You can reduce the amount of chili powder in the recipe and make them plain. The addition of sesame seeds adds extra taste to it,so you can increase the quantity if you want. These spicy palakayalu can be added in various varieties of mixtures like Kara Pori, Sago mixture, Cornflakes mixture, Avarekalu mixture etc. In order to avoid them bursting in oil,do no roll them too tightly when rolling them into balls. Cute little beauties these are...hats off to your patience for rolling so many of these, I don't have any patience and would end up in making ping pong sized balls ;) Lovely pictures prathy. Interesting & very tempting...I have not tasted this so far..And the avare mixture sounds yummm too!! Interesting recipe ..looks perfect and yummy..
Best tea time muncher.... Yummy !!! 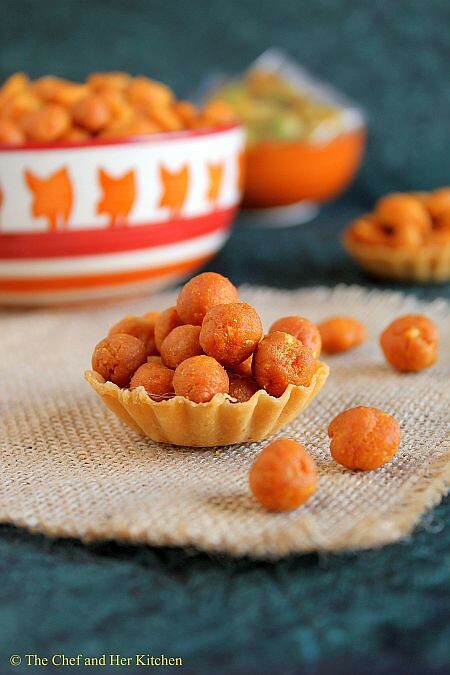 munchies look good in tart shells :) In north we call them "matar" and we get them in long shape. How much I love this one...can keep munching :) ...looks fab and mujhe kuan dega? Sounds too good, drooling here. Loved the clicks, esp the one over canopies. love ur recipes prathy.i regularly watch ur blog nd cook recipes for kids.btw,meeru teluguvalla? Very tempting. Many a times they burst open while frying. How to prevent such fire cracking? Any tips? U have a beautiful space here. Would like to try many recipes. Can u please tell me the size of cup u use in ur cooking. Is it the US standard(1 cup=250ml) or the indian(200ml). Do reply soon. @anonymous..thanks for your comment..Yes I am Telugu.. If i make them i wont stop with one,quite addictive balls. 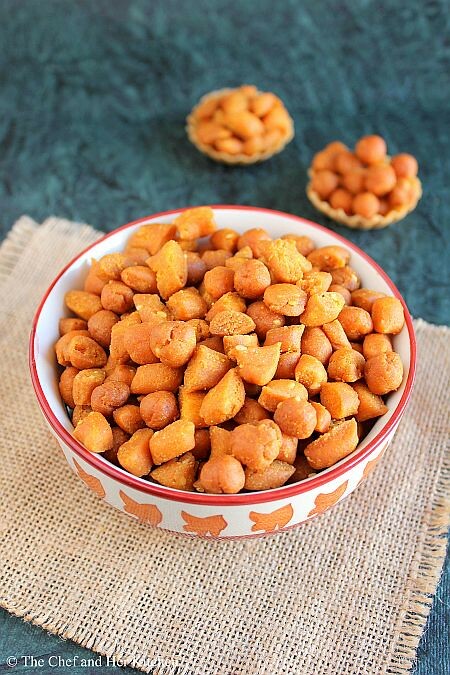 Crispy crunchy snack...Loved the clicks...awesome..
Ummm perfect with a cup of tea,..
Looks tasty & I sure plan to try it this evening! Could you confirm if there is no need to roast the sesame seeds? Or even as much as grinding them to coarse powder? Hi Prathy, I was looking for the snack items to prepare, just saw it and I'm sure palakayalu would be delicious. Thanks for the recipe. Prathy, it reminds me of the rice balls payasam my mom made for Ganesha, my job was to make these small tiny roundels, I used to get so mad, because , I wanted to see all the Ganesha murthis coming to our colony and here I would be making these balls... Yes it requires a lot of patience, I have to credit your mom & you for taking then time, as usual, I love what you post.